Last weekend Wendy and I hosted a New Orleans inspired dinner party for several of our friends with a rather lovely tablescape that didn't suffer one bit from a lack of white napkins. We had a great time with some wonderful food, fun company, and our fair share of debauchery. 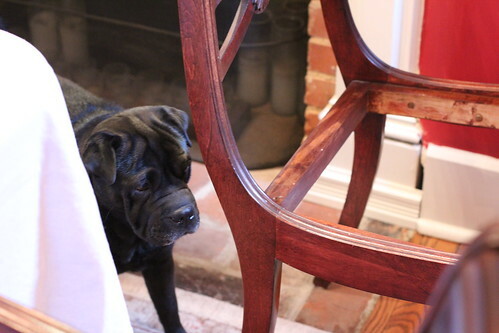 However, we had a little bit of an issue with our dining room set that we had to deal with in the hours before everyone's arrival. A little while ago we were moving one of our dining room chairs around and I noticed a little bit more of a wobble than normal. The dining room set we own is a solid wood 1940's table, chairs, china cabinet, and buffet that we purchased back in 2003 just after we bought our house. It's quite solidly made and absolutely wonderful, especially given the roughly $2000 price tag for the whole thing. Throughout the years it's been a great dining set and has served us quite nicely. However, the chairs have always been a little bit unsteady since the day we brought it home. Unfortunately, this one more-wobbly-than-the-others chair had a failure of a more catastrophic nature. Let's see if you can spot the issue? Do you see it? Let me give you a hint and a closer photo -- look at the area where the seat meets the leg on the right. Still don't see it? Yeah, it's sort of hard to pick out, let me show you one more photo of what I saw that made me say "holy crap!" 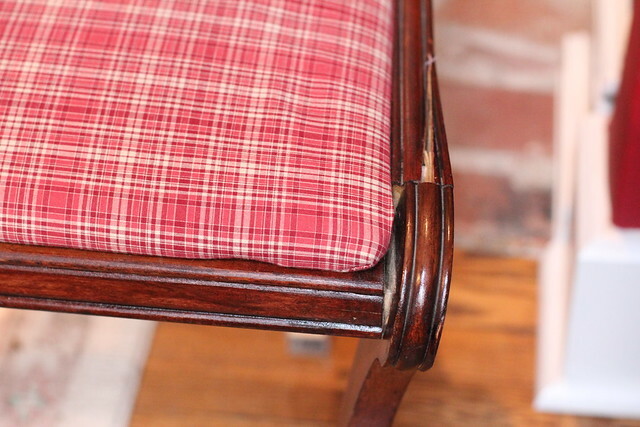 At some point, someone must have sat awkwardly on the chair and put so much stress on it that the dowels from the leg actually split the rail of the chair, offering almost no support if someone were to sit down for a lovely dinner. If we hadn't noticed it, there's a good chance it would have given way like a trick chair when someone sat in it, making it look like we had set up a mean prank. It's a pretty good bet it probably would have ended up in a bruised ego and broken coccyx. Luckily we knew of the issue beforehand and could remove the suspect chair until it was fixed. About three hours before our dinner party, Wendy sends me a text from the grocery store that says, "What about the broken chair?" In spousal terms that simply meant "that chair's been broken for a while, you've known about it, we have people coming over, I don't care if we can't use it for the party, I need to you shut up, stop making excuses, and fix the damn chair today." But that's just it, how would I fix this? The wood is totally split and it's not in a way I can really take it apart and put it all back together, especially not in two or three hours. Lucky for me I have just the tools necessary to make a solid and long lasting fix without needing to fully disassemble the chair. For this repair project I broke out my precision glue applicator. This little pack of "tools" looks more like a medical supply baggie than it does a tool. The bag consists of several plunger vials for glue and various fine tipped applicators resembling and packaged like hypodermic needles. 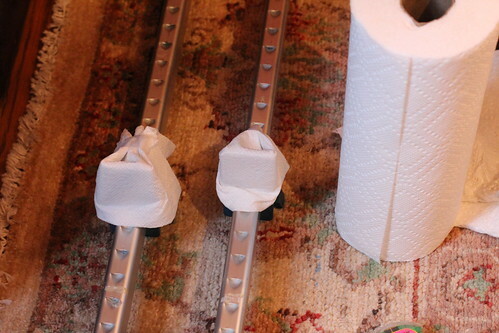 I also grabbed several of my furniture clamps, a roll of paper towels, and my bottle of wood glue. The afternoon of the party I was playing the role of Furniture Medic, M.D.! I knew I'd be clamping directly on the wood for a little while, and the blue anodized aluminum clamps can leave a blue streak on the surface. 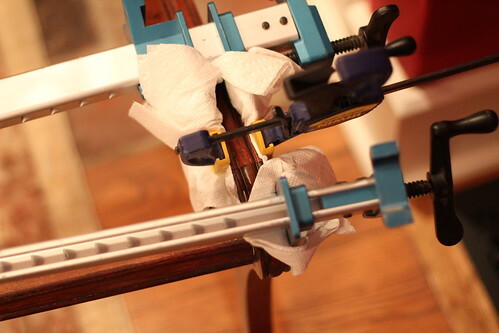 Rather than risk damage to the wood I opted to wrap the surface of the clamps in paper towels to reduce the direct metal on wood contact from the clamps, but I could have just as easily used some small scraps of pine or poplar between the clamp and chair for the same purpose. 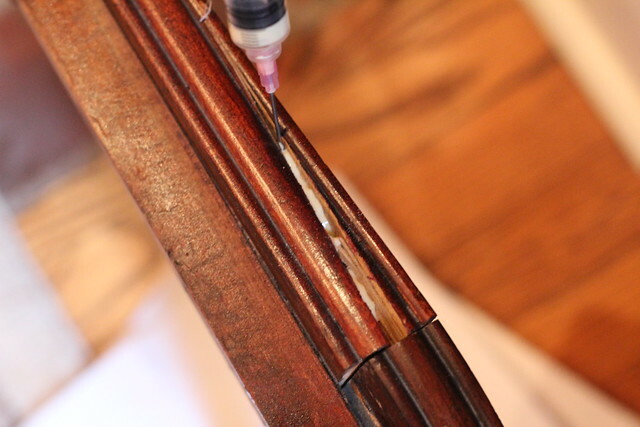 I started the repair by filling the syringe with just enough wood glue for what I'd need. There are really three ways to fill the applicator, the two ways I did it and the right way. 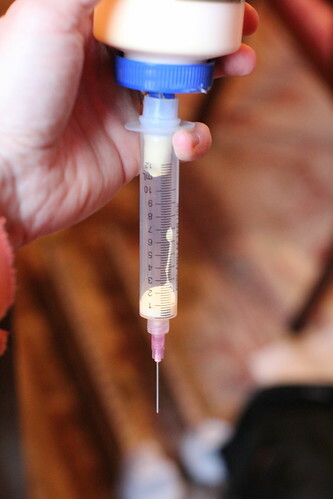 First, I poured some glue into the syringe with the plunger removed and the needle applicator installed on the syringe. This seemed to work fine until I attempted to place the plunger back in the syringe. Since it makes an airtight seal, and the laws of physics pertaining to air under pressure being as they are, I couldn't properly depress the plunger without glue shooting out everywhere. To remedy this I allowed the syringe to sit at an angle until the tip was exposed to air and then put the plunger in, reducing the glue spillage. Next I tried to add a little more glue by pulling the plunger out while the end of the tip was in some glue, expecting it to pull right into the vial. Well, that was more difficult than it needed to be, once again due to those pesky laws of physics regarding the viscosity of liquids and other stuff like that. Technical term alert right there. After all was said and done I think I realized the "correct" way to fill the glue into the syringe. I should have removed the applicator tip and allowed a much larger hole to draw the glue through using negative pressure (pulling up on the plunger). Maybe next time I'll do it right. 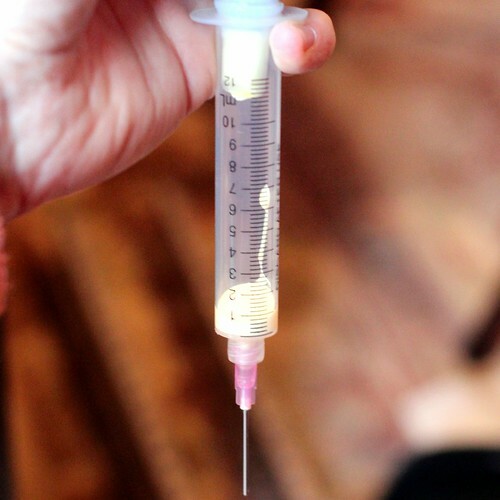 Once I had a sufficient amount of glue in the syringe, as well as a significant amount of disdain for the laws of physics, I proceeded with applying the glue. The whole point of the special applicator tip was to help really get into the seat's crack. I didn't want to further break or disassemble the chair, but I needed to be sure I could get the glue way down into the chair's failed wood. 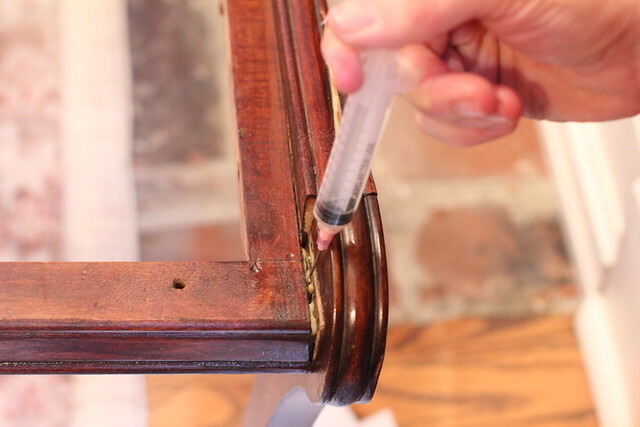 Using the applicator allowed me to get the glue just where it needed to be without getting it all over the place, and it ensured I would have no air pocket voids where the glue would be unable to flow. I applied the glue to both sides of the main crack, around the dowels that i believe were the catalyst for the failure, and to the side of the leg where it met the seat assembly. 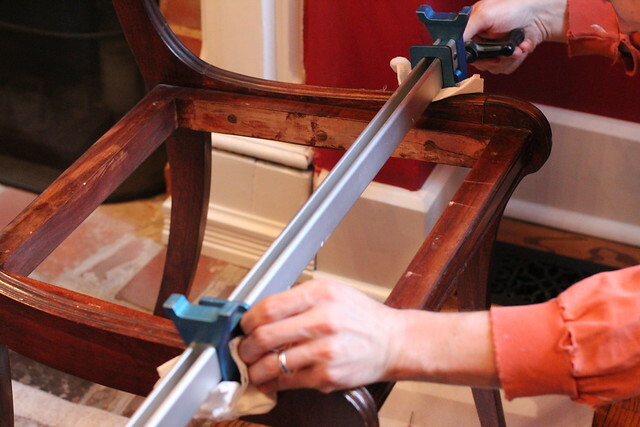 When I was satisfied with how the glue had been placed in the chair, I proceeded with the clamping. First I clamped the top to sort of pull everything together and get the initial glue squeezed out. Then I started to clean up the glue and fight with the clamps a bit to get everything where I wanted it. It sometimes takes a little patience with clamps to be sure you're getting a good and solid hold on the work while ensuring you are doing no damage to the wood or item you're clamping. Luckily, I had a helper to let me know if I was doing it wrong. ...and two for the split area on the side. 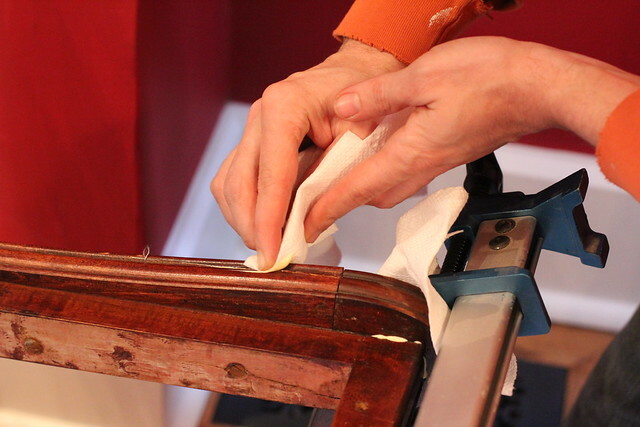 As the glue squeezed out I had a damp paper towel ready to remove any excess glue so it wouldn't dry in the details areas or on the finish of the chair. I had to do this at each step to make sure the mess wasn't overwhelming. After allowing the glue to set up for a few hours I removed the clamps and had myself a sturdy and functional chair. I was able to allow the glue to cure for a full two hours before people arrived, mission accomplished. While the chair could have probably held the weight of a person just fine after a two hour cure, I didn't want to risk either the chair or one of my friend's backsides, so we opted to pull Wendy's Great-Great-Grandmother's chair in from the other room for the evening. The next day I checked on the chair for overall stability. 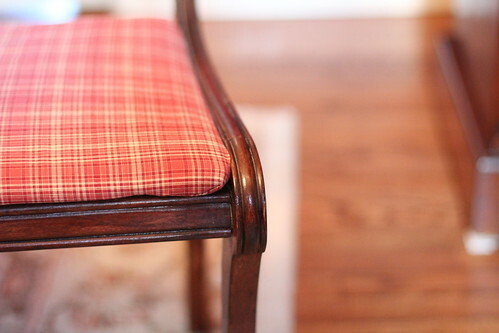 The glue had fully cured and the chair was as good as new...or at least when we bought it "new." 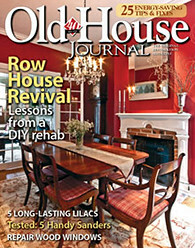 We will eventually be changing out our dining room set for one that is a little bit of a better scale for the room. The current one tends to be a little large, especially the large buffet. But that major change-out can wait for another day. I was able to give our chair a ninth life and am happy that nobody was hurt trying to sit in our broken prank chair. If you're interested in the precision glue dispenser set that I have I can highly recommend it. It's under $10 and as long as you clean it thoroughly with water after each use and before the glue dries in it, you can use it for a very long time. Have you ever had something go awry on the day of a dinner party? Are you like us and try to finish a project or knock something off of your to do list last second before guests arrive, or do you prefer to have a more relaxing and methodical approach to entertaining? You know us, we always want to know how you feel or handle similar experiences. Well done, pure genius. 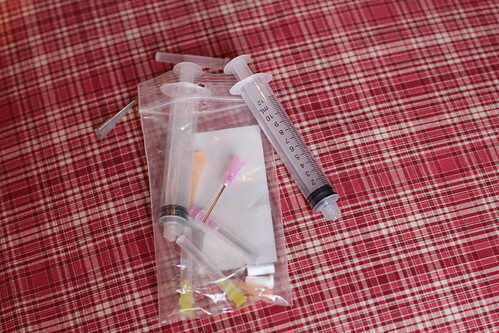 :) I have a bunch of old syringes and needles in my pet emergency kit. I'm now trying to figure out what I could practice on. Ha! I see you used paper towels - lately, as you know form Instragram, I've been rehabbing some chairs and when I glue things I wrap them with wax paper before clamping. I like wax paper because it doesn't stick to the glue really. Wax paper is a great call! I'll probably use a combination of both so that I can keep the wood from getting any dents from over tightening clamps, but the wax paper to keep the clue from sticking. Thanks for the tip! As far as your chairs, if any of the curved backing has any de-lamination around the edges the syringes might be perfect. I'm a little sad that I never get invited to dinner parties at your house. Well done! 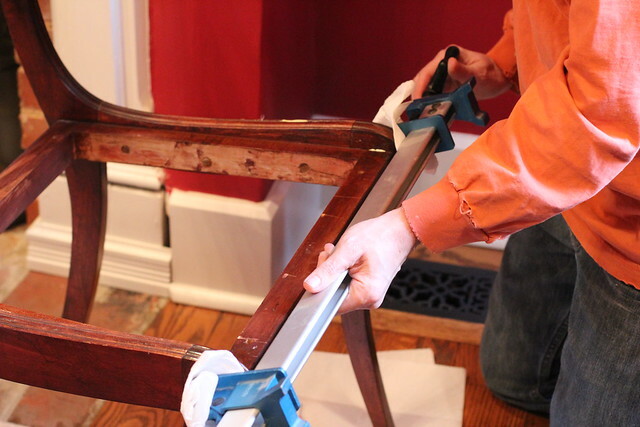 2 days before Christmas we were disassembling the majority of our dining chairs to replace and reglue the dowels in the joints. Here's to last minute fixes! That's awesome...and totally something we would do! 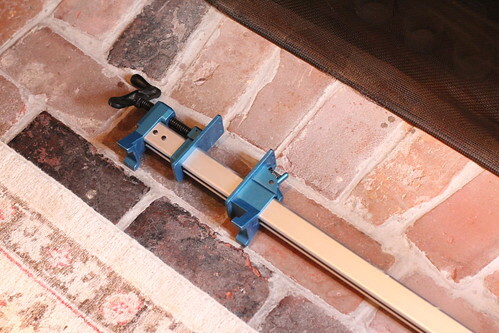 You know, I was thinking about how to repair our coffee table last night and this precision kit would be ideal! Perfect timing! You two are so talented....most people would slap on some tape, hold their breath and hope the chair stays together....and if it did come crashing down with a friend on it, they would laugh themselves silly. I need to get some of those clamps, as I seem to be perpetually gluing chairs made wobbly by my guys. And my mother has the winning story for "things that can go wrong on the day of a dinner party." My brother was born 3 weeks early, and my mom says that as they were wheeling her into the delivery room, she was saying, "I can't have a baby today, I'm having company for dinner!" Heh. These clamps have been incredibly helpful over the years. 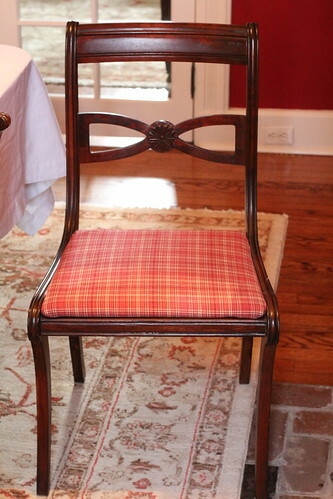 I'm in the process of rehabbing our dining room chairs. We got a great deal on them 8 chairs for $150. 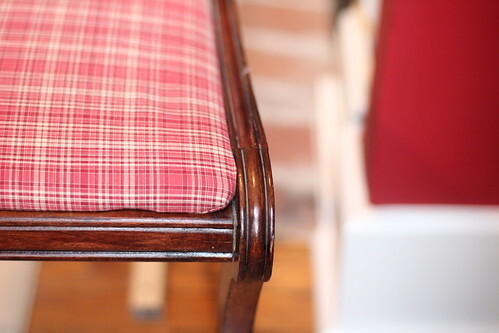 They do need copious amounts of DIY, my wife is reupholstering the chairs after I'm done regluing them. Maybe this is overkill but most of the mortises are a little big so I'm using my block plane to shave some oak. I'm then taking the shaving and gluing them around the tenon. Then I have to sand them down until its a tight fit. I figure I can do a chair a day. Its alot of work but hopefully this means its a repair that will outlast our use for this DR set. Wow, 8 chairs for $150 bucks? Nicely done! It sounds like once you and your wife are done, they'll be sturdy enough for decades to come. Let us know how they turn out! 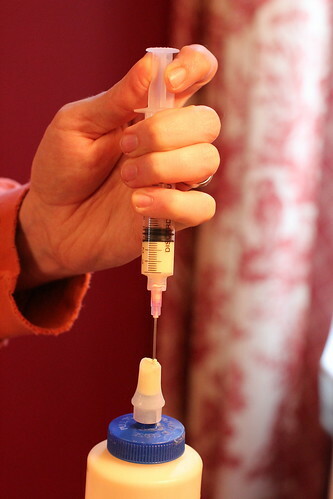 The syringe thing. To fix it. Genius! I didn't even know that was possible. We once had a small get together where a guest sat awkwardly in in the chair and caused a similar fracture as the one you guys had. The chair it self wasn't special so we ended up just putting three small finishing nails strategically to hold it together. Seemed to work nicely for the next two years that we had that dinning set. I would have been a little hesitant to use glue just in case you had to disassemble it at a later time.